For thousands of years, practitioners of traditional medicine have valued frankincense and myrrh for their potent healing properties. Dr. Subhuti Dharmananda of the Institute of Traditional Medicine in Portland, Oregon, notes that these resins are shrouded in rich history; several cultures believed that frankincense and myrrh possessed magical or spiritual energy. Today, practitioners of aromatherapy and herbalism continue to use these fragrant resins to treat disease and promote relaxation. Consult your health care provider before using any form of alternative medicine. Aromatherapy practitioner David Crow, a member of the National Association for Holistic Aromatherapy, located in Banner Elk, North Carolina, reports that tree resins stimulate the flow of bile and improve digestion. He recommends chewing a combination of frankincense, myrrh, cinnamon and cardamom as a traditional treatment for stomachaches. 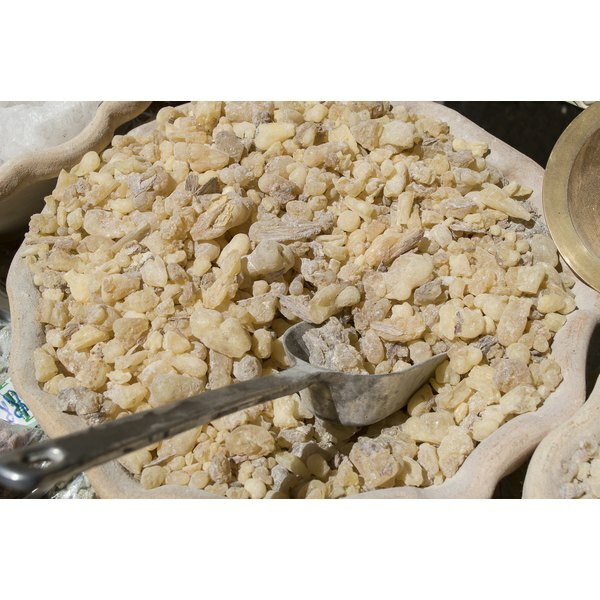 Frankincense and myrrh are both used traditionally as treatments for abscesses, toothaches, gingivitis and halitosis. Extracts of the two resins may be included in natural toothpastes and mouthwashes. Note that the essential oils of these plants are too strong to use topically on the gums; they should be diluted before use. According to the NAHA, powders made from dried myrrh and frankincense can help to promote wound healing. The powders can be blended with aloe vera gel, which acts as a soothing carrier. Essential oils of frankincense and myrrh can be added to humidifiers and hot baths; the fragrant steam can help to loosen phlegm and soothe irritated airways. Crow reports that the traditional use of frankincense and myrrh smoke was to treat respiratory infections, but airborne particulate matter may worsen these conditions. In both modern and traditional aromatherapy, the combination of frankincense and myrrh may be used to treat emotional disturbances, depression and anxiety. Practitioners of massage therapy may integrate frankincense oil into massages to treat tension or emotional trauma. Crow recommends using frankincense as an ingredient in coffee to improve memory and stimulate clear thinking. In Ayurveda, a traditional system of medicine originating in India, frankincense is used extensively as a treatment for rheuamtoid arthritis. Practitioners of Western integrative medicine may recommend frankincense and myrrh resins, orally or topically, to treat arthritis and other forms of inflammatory pain.